Lars Christersson is in the Department of Short Rotation Forestry, Faculty of Forestry, Swedish University of Agricultural Sciences (SLU), Uppsala, Sweden. Kartar Verma works in the College of Forestry, Dr Y.S. Parmar University of Horticulture and Forestry, Nauni, Solan, Himachal Pradesh, India. High-density, sustainable plantations of fast-growing tree species show potential for developed and developing countries alike. Lack of wood is common in many countries – particularly for forest industries in developed countries and for fuel in developing countries. Greater attention to short-rotation forestry on agricultural land and on fertile forest soils could offer a way to provide forest industries with enough wood resources and people in the developing world with enough fuel, while conserving natural forests (Christersson, 2005). Short-rotation forestry is defined in this article as the silvicultural practice under which high-density, sustainable plantations of fast-growing tree species produce woody biomass on agricultural land or on fertile but degraded forest land. Trees are grown either as single stems or as coppice systems, with a rotation period of less than 30 years and with an annual woody production of at least 10 tonnes of dry matter or 25 m3 per hectare. The practice should optimize the use of natural resources, environmentally and economically, through the application of biological, physical, theoretical and practical knowledge (Landsberg et al., 1997). The biomass produced is used for construction, pulp and paper, fodder and energy. Wood from short-rotation forestry may replace wood from tropical forests and from protected forest areas and thus help conserve valuable natural forests for future generations. In what is considered “conventional” forestry in the northern hemisphere, the entire growth potential of a tree species is not fully utilized for various reasons: economic and ecological difficulties in creating optimal water and nutrient conditions; competition from herbaceous plants and other tree species; and biotic and abiotic damage. Short-rotation forestry excludes as many of these limiting factors as possible. Irrigation and fertilization are often used, but only in an ecologically and economically sound way. Plantations are weeded and competing tree species are removed. Species, provenances and clones with high water-use efficiency or high resistance to frost, insects, fungi and bacteria are planted. Fencing prevents browsing by animals. Plantations are harvested when the yearly growth rate no longer exceeds the mean annual increment. The present article summarizes observations made at a session on “Wood production in agroforestry and in short-rotation forestry systems – synergies for rural development” at the XXII International Union of Forest Research Organizations (IUFRO) World Conference in Brisbane, Australia, in August 2005. It describes cases in which as many limiting factors as possible are taken away to achieve maximum growth rate of trees, demonstrating the potential of the practice. Examples include poplar in the United States, Canada and India, willows in Sweden, bamboo in China and Ethiopia and eucalypts in Australia and Brazil. Examples from some other countries recognize further opportunities for short-rotation forestry. The outstanding growth potential of Populus trichocarpa and Populus deltoides has been realized in Canada and the United States by growing to some extent the pure species, but mostly hybrids of the two (Dickmann et al., 2001). Hybrids of other poplar species from Europe and Japan have also been introduced (Steenackers, 1990). In Canada and the United States, commercial establishment of poplar plantations began for the most part in the 1980s. Spacing varies from 2 × 2 to 3 × 3 m and rotation time from six to seven years. Most of the plantations are located in the provinces of Alberta and British Columbia in Canada and in the Mississippi River Valley and the state of Washington in the United States. Annual production reaches 10 to 15 tonnes per hectare (Stanton et al., 2002). Even in the semi-desert near the Columbia River, irrigated and fertilized hybrid poplars achieve an annual production of 15 to 20 tonnes per hectare (Heilman and Stettler, 1985). Initially poplar wood was used for paper and pulp, but in some plantations, wider spacing and longer rotations are used (sometimes in conjunction with thinning), and some companies now use it for timber, wall panelling, fruit boxes and furniture. In the homeland of the genus, irrigated plantations of Eucalyptus species have shown real growth potential. In experiments with plantations of Eucalyptus species carefully selected for rapid growth, irrigated with effluent wastewater from towns and industries, annual production of up to 40 tonnes of dry matter per hectare has been reported in southeastern Australia (Baker, Duncan and Stackpole, 2005). fast-growing Eucalyptus spp., with spacing of 6 to 10 m in rows 50 to 100 m apart, have been planted on agricultural land to lower the ground-water table enough for successful agriculture (Wildy et al., 2000). The total above-ground biomass production, including leaves, is about 10 tonnes per hectare annually and is used in the production of charcoal powder, eucalyptus oil and energy. Energy forestry – short rotation plantations of carefully selected Salix species and hybrids in coppice systems for production of biomass for energy production – was developed in Sweden after the oil crises in 1973 and 1979 (Sirén et al., 1983). Factors that enabled the successful introduction of this type of short-rotation forestry to replace fossil fuels included the existence of well-developed district heating systems in almost all towns and villages and the already widespread use of wood energy (up to 20 percent of all energy) in Sweden. Other driving forces included overproduction in agriculture, which made land available for forest plantations, the high cost of imported oil and gas, and concern about the greenhouse effect of CO2 emissions resulting from combustion of fossil fuels. In this type of silviculture, 20 cm Salix cuttings are planted on agricultural land in a double-rowed coppice system, with repeated harvests after two to four years (Verwijst, 2001). There are 16 000 ha of energy forestry plantations in Sweden today, but based on the overproduction in agriculture and the government’s goal to make Sweden independent of imported oil, the potential could be estimated at 500 000 to 1 million hectares. Single-stem plantations of introduced Populus trichocarpa and P. deltoides and hybrids of these have also achieved large woody biomass production (Karacic, Verwijst and Weih, 2003; Christersson, 2006). Only a few hundred hectares have been planted, but the results are so impressive that many farmers are showing an interest in planting more. The wood will be used for paper as well as energy. Dimitriou and Aronsson, 2004).Waste water and sewage sludge, which contain large amounts of nitrogen and phosphorus, are used to fertilize and irrigate plantations of willows and poplars. The waste products can also contain polluting heavy metals, which some willow clones are able to absorb efficiently. When wood from this type of plantation is burned, heavy metals can be extracted from the fly ash and bottom ash. However, this process is not yet economical, so today most of the ashes are deposited at city waste disposal sites. In southern Finland, hybrid aspens (Populus tremula × Populus tremuloides) grown for particle board have the potential to produce 20 m3 per hectare per year. Some experiments with short-rotation Salix spp. for biomass for energy are as long running as those in Sweden, with annual production in small plots of almost 1 kg per square metre for a Salix phylicifolia plantation on limed and fertilized peat land in the far north (latitude 64oN) (Pohjonen, 1991). 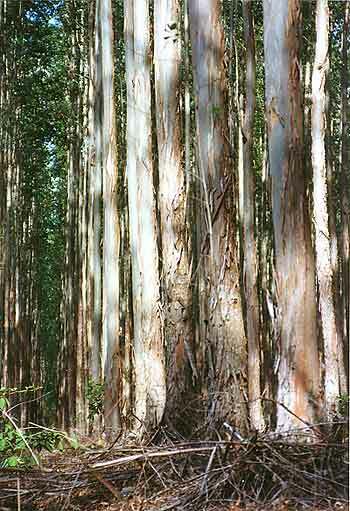 In the Aracruz area of Brazil, plantations of fast-growing hybrids of Eucalyptus spp. are producing about 300 to 350 m3 per hectare in seven years. On the best soils in this area, without irrigation, annual production of 60 to 90 m3 per hectare has been reported. Despite annual precipitation of 1 300 to 1 400 mm, experiments have shown that irrigation with effluents from communities and industry can double production. Most of the Aracruz plantations are on laterite soils, and all such forest plantations are limed with dolomite and calcium carbonate and fertilized, particularly with phosphorus and nitrogen. Some ant and caterpillar infestations have been recorded. To minimize risk of pests and diseases, companies try to maintain a broad genetic base in the breeding programme (Lorentzen, 2001). There are some 1 500 bamboo species in the world (all in the family Gramineae), and about 40 percent of these species are found in China (Ohrnberger, 1999). Many grow so fast that their cultivation can be considered as short-rotation forestry. Bamboo has been grown in China for thousands of years, for many different purposes. Bambusa chungii, for example, is planted in tropical China; the annual above-ground production may reach 30 to 40 tonnes of dry matter per hectare at different rotations (Scurlock, Dayton and Hames, 2000). Organic and inorganic fertilizers are used systematically. Commonly used organic fertilizers are compost, human waste and barnyard manure. These are applied at the rate of 1.5 to 4 tonnes per hectare per year, buried in 5 to 10 cm-deep channels between the bamboo plants (MOST, INBAR and INFORTRACE, 2002). As a result of restrictions on felling in natural forests imposed by the Indian Government, fast-growing, short-rotation forest plantations are emerging as a major source of raw material for Indian wood-based industries. Forest plantation activities have been emphasized since the Indian Government recognized, as early as 1961, the gap between supply and demand for all types of wood. 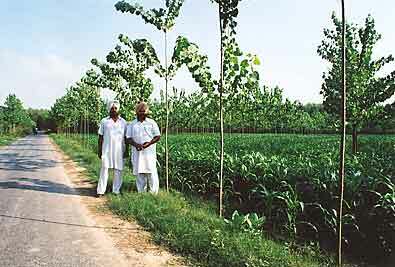 Chaturvedi (1998), in a review of Indian industrial plantations cultivated under various schemes, highlighted a need for plantation of short-rotation species, e.g. Eucalyptus, Casuarina and Populus species, to meet the growing demand for raw material for wood-based industries. In response to recent commercial plantation activity in central and southern India, there is also renewed interest in growing teak (Tectona grandis) on short rotations. Research on teak wood quality is focusing on heartwood production and timber strength from plantations with relatively low-input management. Gmelina arborea has been grown successfully on short rotations for pulp and paper in the north-eastern humid tropics. In humid tropical areas of northeastern India, Acacia auriculiformis can be harvested four years after planting, with excellent biomass yields. Almost 50 percent of the yield goes to pulp; the other 50 percent is used as fodder. Poplars and teak are also frequently used in agroforestry, particularly in agrosilvicultural, silvipastoral and silvimedicinal systems. Short-rotation forestry is practised much more on farmers’ private land and on non-forest land than on forest land, 95 percent of which is under government control. Planners and policy-makers are encouraging the planting of fast-growing industrial wood crops on farms and non-forest land for environmental uses, as well as to provide fuelwood and small roundwood which may not be harvested from natural forests. Farmers in the foothills of the northwestern and central Himalaya commonly plant Populus deltoides with rotations of 8 to 12 years. The rotation for irrigated P. deltoides on agricultural lands in the alluvial plains of Punjab, Haryana and parts of Uttar Pradesh is four to eight years. A single poplar tree with a rotation of six to nine years in the plains and 15 to 25 years in the hills produces on average 0.5 m3 of timber. nitrogen-fixing tree species have been found suitable for site amelioration and biomass production for fuel and fodder. Examples include Leucaena leucocephala with Melia azedarach and Eucalyptus spp. hybrids in subtropical foothills and Robinia pseudoacacia with Acacia mollissima and Morus spp. in the subtemperate middle hills of the north-western Himalaya. Prosopis juliflora and Acacia nilotica (with 9- to 14-year rotations) are suitable for fuelwood and site amelioration in the northern and northwestern plains. Most of the natural tropical moist forests in the Philippines have either been clear-cut or selectively cut with removal of the largest trees. Short-rotation forest plantations, mainly of Gmelina arborea and some Acacia species, have been established on some islands (Diaz and Tandug, 1999), and short-rotation forestry has been introduced in a type of lowland agroforestry system (Saplaco, 1999). Some foreign companies, from New Zealand for example, have recognized the suitability of the climate and water conditions for short-rotation forestry and are replanting clear-cut areas, e.g. on Mindanao Island. An example of potential for short-rotation forestry is found in southern Chile, where some 4 million hectares of land in the Aisén area, around the city of Coihaique, were deforested over the past 50 years to provide space for a cattle-breeding industry for beef exports to Europe and the United States. Since the cattle industry failed, this land now offers excellent prospects for successful short-rotation forestry. This land was previously covered by vast forests of many different tree species, including southern beeches (Nothofagus and Podocarpus species) and broadleaf evergreen trees (e.g. Eucryphia and Laurelia species). Annual rainfall (300 mm close to the Argentine border, but up to more than 2 000 mm towards the coast) and temperature are favourable for successful tree plantations. Some 12 000 ha of Eucalyptus globulus plantations have been established near Addis Ababa (E. Olsson, personal communication). Annual production has varied from 13 to 46 m3 per hectare, with the maximum mean annual increment for coppice and single-stem stands reached after 14 years and 18 to 19 years, respectively (Pukkala and Pohjonen, 1990). However, the potential for further plantations throughout the country is great because of the large land areas available and the favourable climate for growing trees. In some areas where large areas of old-growth forest have been clear-cut the annual rainfall reaches 2 000 mm. Although nutrient shortages are a problem, this could be solved to some extent by introducing vegetation filters as described above in the section on Sweden. Bamboo and fast-growing tree species such as Eucalyptus, Cordia, Cupressus, Shinus and Gmelina species and hybrid poplars could be used to filter waste water and sewage sludge used for irrigation and fertilization. Such plantations would be especially needed around Addis Ababa. Ethiopia has hundreds of thousands of hectares of bamboo stands (highland bamboo, Yushane alpine, and lowland bamboo, Oxytenanthera abyssinica) in very remote areas where unemployment is high. 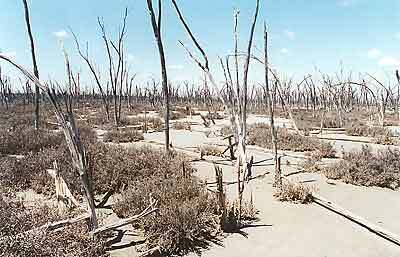 Silvicultural methods might be developed for the management of such areas (Kassahun, 2001). Research in this area has been going on for some years through a collaboration between Wondo Genet College of Forestry in Ethiopia and the Swedish University of Agricultural Sciences (SLU). The wood and bamboo produced through short-rotation forestry can be used for fuelwood, construction material, paper, particle board and many other products. This is another area of research by Wondo Genet College and SLU. Short-rotation forestry produces large amounts of biomass for energy and paper through the use of fast-growing tree species. The full growth potential of a tree species is realized by creating optimal water and nutrient conditions, eliminating competition by herbaceous plants and other tree species, and preventing biotic and abiotic damage. Land that can be used for this type of plantation includes agricultural land that is no longer needed for agriculture because of overproduction; clear-cut forest land in tropical and temperate areas; and degraded land, especially in many developing countries. The methods used should be accepted from environmental, economic and aesthetic points of view. Production from short-rotation forestry facilitates protection of valuable natural forests by meeting needs for wood resources. The establishment of vegetation filters, in which nitrogen and phosphorus in waste water and sewage are used for irrigation and fertilization in short-rotation forestry, can be of particular interest in developing countries where technically advanced purification plants are too expensive to establish. Vegetation filters also help prohibit eutrophication (nutrient pollution) of nearby streams and lakes. Baker, T., Duncan, M. & Stackpole, D. 2005. Growth and silvicultural management of irrigated plantations. In S. Nambiar & I. Ferguson, eds. New forests: wood production and environmental services, pp. 113–134. Collingwood, Australia, Commonwealth Scientific and Industrial Research Organisation (CSIRO). Chaturvedi, A.N. 1998. Plantations as a source of industrial raw material for wood-based industry. In K. Damodaran, B.S. Aswathanarayana, T.R.N. Prasad, K. Hyamasundar & S. Padmanabhan, eds. Proceedings of national seminar on processing and utilization of plantation timber and bamboo, Bangalore, India, 23–24 July 1998, pp. 13–19. Bangalore, Indian Plywood Industries Research and Training Institute (IPIRTI). Christersson, L. 2005. Plant physiological aspects of woody biomass production for energy purposes. In K.S. Verma, D.K. Khurana & L. Christersson, eds. Short rotation forestry for industrial and rural development. Nauni, Solan, Himachal Pradesh, India, Indian Society of Tree Scientists. Diaz, C. & Tandug, L. 1999. Development and management of short-rotation forestry in the Philippines. In Proceedings of a joint meeting at the University of the Philippines, Los Baños College, Laguna, the Philippines, 3–7 March 1999. Dickmann, D., Isebrands, J., Eckenwalder, J. & Richardson, J. 2001. Poplar culture in North America. Ottawa, Canada, National Research Council of Canada Press. Dimitriou, J. & Aronsson, P. 2004. Nitrogen leaching from short-rotation willow coppice after intensive irrigation with wastewater. Biomass and Bioenergy, 26: 433–441. Heilman, P.E. & Stettler, R.F. 1985. Genetic variation and productivity of Populus trichocarpa and its hybrids. Part II. Biomass production in a 4-year plantation. Canadian Journal of Forest Research, 15: 384–388. Karacic, A., Verwijst, T. & Weih, M. 2003. 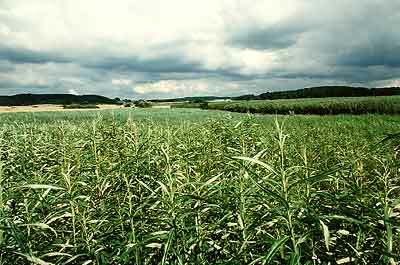 Above-ground woody biomass production of short-rotation of Populus plantations on agricultural land in Sweden. Scandinavian Journal of Forest Research, 18(5): 427–437. Kassahun, E. 2001. The potential of bamboo as an interceptor and converter of solar energy into essential goods and services: focus on Ethiopia. International Journal of Sustainable Development and World Ecology, 8: 346–355. Landsberg, J., Prince, S., Jarvis, P., McMurtrie, R., Luxmoore, R. & Medlyn, B. 1997. Energy conversion and use in forestry: an analysis of forest production in terms of radiation utilization efficiency. In H.L. Gholz, K. Nakane & H. Shimoda, eds. The use of remote sensing in the modeling of forest productivity. London, UK, Kluwer Academic Publishers. Ohrnberger, O. 1999. The bamboos of the world. Amsterdam, the Netherlands, Elsevier. Perttu, K. & Obarska-Pempkowiak, H., eds. 1998. Sewage treatment by means of pine, willow, reed and grass vegetation filters. Proceedings of a joint Polish-Swedish workshop in Starbienino, Poland, 25–28 May 1997. Department of Short Rotation Forestry, Report No. 61. Uppsala, Sweden, SLU. Pohjonen, V. 1991. Selection of species and clones for biomass willow forestry in Finland. Acta Forestalia Fennica, 221: 1–58. Pukkala, T. & Pohjonen, V. 1990. Yield models for Eucalyptus globulus fuelwood plantations in Ethiopia. Biomass, 21: 129–143. Saplaco, S. 1999. Lowland agroforestry system (LAS): potential for farmer-based short rotation forestry. In Proceedings of a joint meeting at the University of the Philippines, Los Banos College, Laguna, the Philippines, 3–7 March 1999. Scurlock, J., Dayton, D. & Hames, B. 2000. Bamboo: an overlooked biomass resource. Biomass and Bioenergy, 19: 229–244. Stanton, B., Eaton, J., Johnson, J., Rice, D., Schuette, B. & Moser, B. 2002. Hybrid poplar in the Pacific Northwest: the effects of market-driven management. Journal of Forestry, 100(4): 28–33. Steenackers, V. 1990. 40 years of poplar research in Geraardsbergen. Geraardsbergen, Belgium, Station voor Populierenteelt. Verwijst, T. 2001. Willows: an underestimated resource for environment and society. Forestry Chronicle, 77(2): 281–285. Wildy, D., Bartle, J., Pate, J. & Arthur, D. 2000. Sapling and coppice biomass production by alley-farmed ‘oil mallee’ Eucalyptus species in the Western Australian wheatbelt. Australian Forestry, 63(2): 147–157.